Life shifts in Genoa City when Victor's son comes clean to Rey and Summer pours her heart out to young Mr. Abbott. Spoiler alerts for "The Young and the Restless" tease that two stunning confessions will come forth in Genoa City by the week's end. Both Nick and Summer will decide to tell the truth despite the consequences that follow. Soaps She Knows spoilers say Victor Newman's son will reveal all to Rey, but his confession will not be what the detective is waiting to hear. 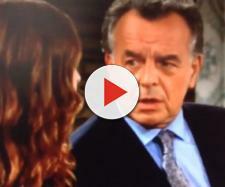 The Newman patriarch's granddaughter is seen on a spoiler video saying "I love you, Kyle." This could be a dream, a daydream, or the real deal. Summer's declaration of love may come a little too late, as Kyle will be interested in Lola. Celeb Dirty Laundry indicates that "Y&R" fans are unhappy with current storylines, one of which is Summer trying to seduce Billy -- who is dating her mother. Ms. Newman bet Kyle she could get her mother's lover in bed but it never happened. By losing the bet Summer was supposed to sleep with her former lover. When Kyle realized Summer had no feelings for him and was only honoring the bet, he pretended to be asleep and the night of passion promised by spoilers never took place. Now Soaps She Knows spoilers indicate that Summer will tell Kyle that she loves him. The spoiler does not indicate whether Summer's declaration of love will be before or after Kyle meets Lola, only that she confesses her love for him. It's clear that Kyle really loves Summer but spoilers don't say how he will react to the news that she is into him as well. At the end of Tuesday's " Y&R" episode, Rey was arresting Nick but did not tell him why. When he came to town Arturo's brother said he was investigating suspicious activity on J.T. 's credit card. It's not clear if the detective knows that Victor's son also impersonated J.T. but spoilers say he is going to make a confession. It could be that he will admit that he used the credit card to get even with his dad but he may also acknowledge that he was impersonating Mr. Hellstrom. Soaps She Knows and Celeb Dirty Laundry both have said that the cover-up crew is going to panic because of this shift in events. Nikki, Phyllis, Sharon, and Victoria may believe that it is only a matter of time before the new detective closes in on them and finds out they are responsible for J.T. 's death. Stay tuned to "The Young and the Restless" weekday afternoons on CBS at 12:30PM EST. Nick and Summer's confessions are going to turn up the heat.